This afternoon, I learned that renowned astronomer Edwin Salpeter died last Tuesday from leukemia at his home in Ithica, New York. Salpeter was one of those astronomers that few in the public had heard about, but who had a tremendous impact on the science of astronomy. I never met Salpeter, but I am well aware of his impact on our field. Most of us younger astronomers first become aware of Salpeter's name through what we cann the "initial mass function," which is a simple mathematical equation giving the number of stars of each mass arising from stellar nurseries, like the Orion Nebula. Salpeter's equation describes how there are a lot more little stars than big stars. His equation is still in common use some 50 years later. 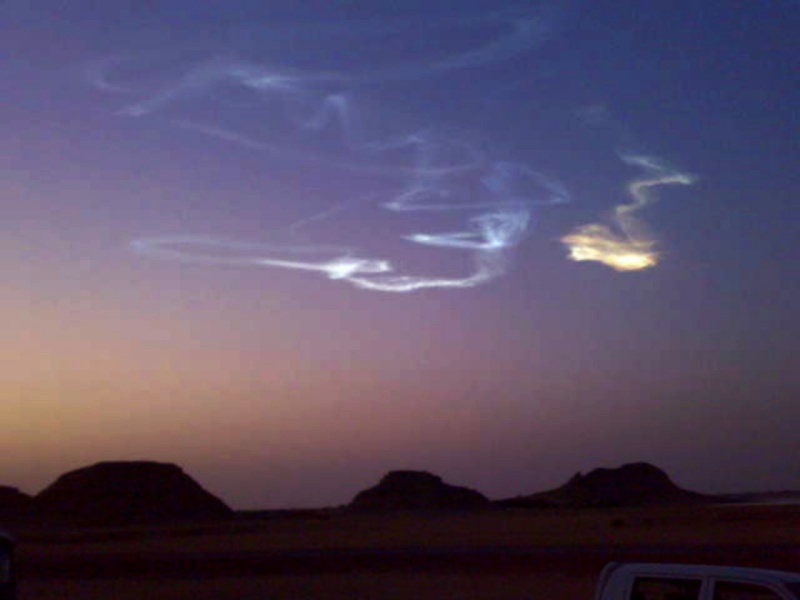 Salpeter's biggest contribution may have been in understanding how stars burn helium into carbon. To make carbon requires three helium atoms smashing together almost simultaneously; it took some tricky quantum physics work to figure this out. Along with Nobel-prize winning physicist Hans Bethe, Salpeter developed the mathematical framework for some types of two-particle systems (but don't ask me to explain it, because I personally have never studied this field of physics). Salpeter's list of achievements goes on; running through his obituary and his webpage, I found myself reading about an important bit of astronomy research and saying, "I didn't know he worked on that." It's quite impressive. Tomorrow is Thanksgiving day here in the United States, one of the biggest holidays of the year. I had never thought too highly of Thanksgiving as a kid: it meant traveling 14 hours through at least three states in heavy traffic, a huge meal in a house full of relatives stuffed to overflowing, and generally getting into trouble because I was in the way. But that changed in 1996, when I was living in Munich, Germany for the school year. I was studying astronomy at the Max-Planck-Institut für extraterrestriche Physik in Garching, Germany as part of the Fulbright program. In Germany, the fourth Thursday of November is a normal work day, not a holiday. So, on that day, I found myself in front of a computer in my cubicle, trying to analyze X-ray pictures from the ROSAT satellite. And, surprisingly, I found myself quite dejected, since nobody knew (or cared) that it was a major holiday. In the early afternoon, I gave up and went home. The next afternoon, I headed to a southern part of Munich. A German lady there was holding an American Thanksgiving dinner for all of the Munich Fulbright scholars and our host families. We were going to have turkey, mashed potatoes, pumpkin pie, and so on. We (the scholars) were supposed to arrive early to help with the cooking and preparations. I showed up just a few minutes early. The Germans, and in particular our dinner host, are big on the idea of punctuality, or being exactly on time. (I often joked to my American friends in Munich that Pünktlickheit is fast göttlichkeit , or "punctuality is next to Godliness".) The other scholar didn't show up on time, and our host quickly started to mutter "Americans never come when they say they are going to." And as the time stretched on, our host grew more and more angry that my friend and fellow scholar was late. In the meantime, I learned that our "American" Thanksgiving dinner was anything but. My host told me that she couldn't find Turkey, so we'd be having pork. And she didn't feel like making mashed potatoes, so we were having sauerkraut. And she didn't want to make a pumpkin pie, so we were having a strudel for dessert. As I helped set the table and tried to help cook these foods, I noticed that it was snowing heavily, and my friend still wasn't there. Finally, almost two hours late, the doorbell rang. The other scholar had finally arrived. My host opened the door wide, and I saw what looked like a snowman on the front step. My friend had taken the wrong bus, ended up about 4 or 5 miles away, and then found that she had ridden the last bus of the day on that route, so she had to walk the entire distance through the snow. So, cold, wet, shivering, and with a good inch of snow perched on her hood, she was greeted with a stern, "Why don't you Americans ever come when you promise to?" I felt ill. So much for a jolly holiday celebration. Things did improve about an hour later, when our German host families arrived right on time. Both of these families are very jovial and friendly, and they lightened the mood considerable. So, in spite of having a Thanksgiving meal consisting of pork, sauerkraut, and strudel, it wasn't horrible. But the best part came that night. Back at my apartment building, there were five American students (counting myself). We decided to have a proper Thanksgiving meal. We only had a small kitchenette (with only a stove and a few pots and utensils), so we couldn't roast a turkey, but we found some canned turkey that we heated. We made some stuffing (that was a little runny) and some mashed potatoes (that were very lumpy). But in spite of the failings of the food, we all discovered that it was the fellowship that mattered. Sitting around a small table in a strange country with only the barest remnants of a true Thanksgiving feast, we were all truly happy and thankful for the blessing that was our camaraderie. Although we all enjoyed our studies abroad, we'd found that we still needed to cling to each other and those unique cultural traditions that we shared. So, these days, when Thanksgiving preparations start to get too frustrating, I always think back to that Thanksgiving in Germany. That's where I learned what I am truly most thankful for. Not a giant feast, not a day off of work, nor other ephemeral things. But I am thankful for friends and family, and the support we give each other, even in the roughest of times or the strangest of places. 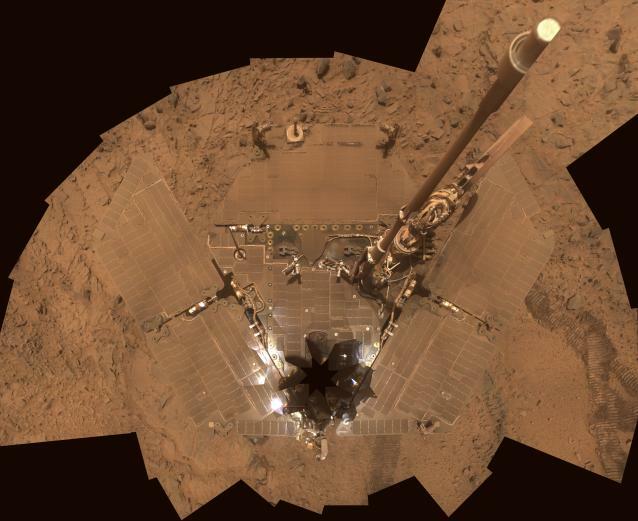 Last week, NASA announced the demise of the Mars Phoenix mission, ostensibly because the setting sun at Mars's north pole caused the lander to run out of power. To celebrate the Mars Phoenix mission, Gizmodo held a Photoshop contest -- what pictures did Mars Phoenix take that NASA will never show? Here are the winners. Note: Except for this picture, I guarantee that all of these are fakes. P.S. For those who want to continue to get updates on the Mars Phoenix findings, try Twitter. P.P.S. Those of you who don't know what a Illudium Pu-36 Explosive Space Modulator is, who would want to steal it, or why, click here. In what was obviously a press release coordinated with the Hubble announcement of a picture of a planet around another star, astronomers at the Gemini Observatory in Hawaii announced today that they have pictures of two planets around a single star. This star, known just by its catalog number HR 8799, is 130 light-years away in the direction of the constellation Pegasus. Further follow-up with the Keck Observatory revealed a third planet closer to the star. These are big planets, about 10, 10, and 7 times the size of Jupiter. Like the planet around Fomalhaut, these planets orbit pretty far from their parent star: 25, 40 and 70 times the Earth-sun distance. For comparison, Jupiter orbits the sun at 5 times the Earth-sun distance, Saturn at 10 times the Earth-sun distance, and Neptune at 30 times the Earth-sun distance. We've entered a new era of planet discovery today. For the first time, we have a growing number of pictures of other planets. Sure, they are all bigger than Jupiter, and we can't yet see any features on those planets (they are just too far away). In the fall, low in the southern sky hangs a lone bright star named Fomalhaut. Other than being one of the brighter stars in the sky and being relatively nearby (about 25 light-years away), Fomalhaut remained fairly obscure for most people until the 1980s. That's when a NASA infrared satellite called IRAS discovered that Fomalhaut had a lot of extra infrared light that could be explained by a lot of dust around the star, dust that could be explained by a forming planetary system. In 2005, the Hubble Space Telescope took a picture of this dust, and it looked like almost a perfect ring. Except that the ring was not exactly centered on the star, like you would expect -- it was offset a little bit. The team taking the Hubble picture suggested that a planet's gravity could be pulling the ring off-center, and astronomer Alice Quillen calculated that this planet could be as small as Neptune. But the planet remained hidden. In a paper accepted to the prestigious journal Science, astronomer Paul Kalas, who had taken the first Hubble picture of Fomalhaut, announces that a second Hubble picture (above) has revealed a planet about twice the size of Jupiter orbiting Fomalhaut. In the picture above, the box shows a blow-up of the same portion of the old and the new images, and a tiny dot of light is seen to have moved a tiny bit in the same direction as the ring, just what one would expect for a planet orbiting the star! Not shown is the more important bit of information for us astronomers, that the ring and the dot are both following Fomalhaut through the sky. All stars move in the sky as our Solar System and the stars move relative to one another. Fomalhaut moves at a fairly high rate, so that accurate pictures taken a few years apart can show its motion. A few other dots in the Hubble image didn't move with Fomalhaut, indicating that they aren't related -- they are just other stars in the distance. But since the ring and the planet, now called Fomalhaut b, moved with Fomalhaut, we know that they are all related. 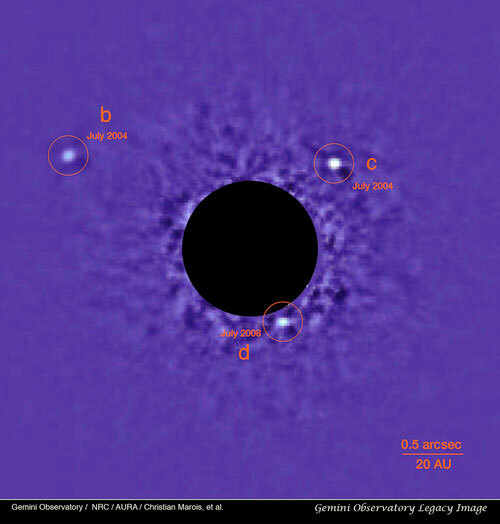 Past claims of pictures of planets around other stars proved to be premature, as later pictures showed them not to be moving with their purported parent across the sky; Fomalhaut b does not have this problem. Based on the pictures and how far the planet moved in its orbit, and based on new models of the ring by team member Eugene Chiang, Paul Kalas's team estimates that the planet is about twice the mass of Jupiter, and located 115 times further from Fomalhaut than the Earth-sun distance, or about 10.7 billion miles away. It takes this planet almost 900 Earth-years to orbit Fomalhaut once. There are many head-scratching things about this planet. First, how could such a big planet form so far away from the star? We didn't think that was possible, so maybe the planet moved out from closer to the star (this happened to Neptune and Uranus in our Solar System), or maybe it formed out there, showing we don't understand planets. 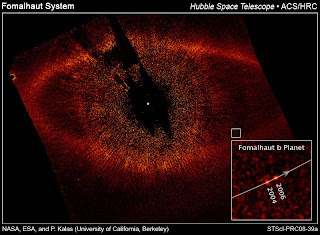 Fomalhaut b is also about 100 times brighter in visible light than models predict for a planet of its size. Maybe Fomalhaut b has a ring around it, like Saturn, or maybe our models of its atmosphere are completely wrong. We have only a very few limits on planetary atmospheres outside our Solar System, so it wouldn't surprise me if these models are just plain wrong.. Also, Fomalhaut b's brightness changed by about 60% in between the two pictures, which could mean that any ring around the planet is changing fast, or perhaps that the weather on the planet is rapidly changing, or perhaps that there is a variable amount of dust and rock blocking some of the planet's light. There's obviously still a lot of work to be done here! To me, the most amazing part of this discovery is the technical aspect. Fomalhaut b is one billion times fainter than Fomalhaut, and it is located just 15 arcseconds (or four thousandths of a degree) away from the star. This is roughly like trying to find a single lightning bug four feet away from a collection of 150 searchlights from ten miles away. That ain't easy. And that's the power of the Hubble Space Telescope. Congratulations to Paul Kalas and his collaborators on their discovery! Today, on our astronomy preprint server (a website where we can put professional papers before they appear in our trade journals), a paper of mine appears. I've been working on the specific data presented in that paper for about 7 years now, so I am happy that this particular paper is almost completely finished (just some copy editing and exchange of bribes publishing fees remain). The paper involves looking at white dwarfs, the glowing embers of dead stars, in the open star cluster Messier 35. Messier 35 is a group of related stars about 3000 light-years away in the constellation Gemini; the stars in the cluster are 150-200 million years old. The reason I was looking at the white dwarfs in Messier 35 is because I want to know what the line is between stars that end their lives as supernova explosions and those that end their lives as white dwarfs. We astronomers are pretty confident that this difference is due almost entirely to the mass of a star -- very massive stars explode, and lower-mass stars make white dwarfs. But what is that line, exactly? In Messier 35, the stars that are currently ending their lives are about 5 times the mass of the sun, and we see white dwarfs in the star cluster. That tells us that stars 5 times the mass of the sun aren't big enough to explode. But my collaborators and I went one step further. White dwarfs have no nuclear energy source. They shine because they used to be at the middle of a star, which was hundreds of millions of degrees! Now that the star is dead, the white dwarf cools off, just like a hot poker taken from a fire will cool off and fade away. We can calculate how fast white dwarfs cool, so if we can measure how hot they are, we know how long they've been cooling off. That means we know how long ago the white dwarf's parent star died. So what? Now comes the tricky part. We know how old all the stars in Messier 35 are, about 175 million years old. Say that I find a white dwarf that's been cooling off for 75 million years. That means that the white dwarf's parent star was 100 million years old when it died (175 million - 75 million = 100 million). We then look at tables that tell us how long a star's life is (that just depends on the star's mass), and, voila! We know how massive each white dwarf's parent star is. When I did this in Messier 35, I found some white dwarfs came from stars as massive as 6 to 6.5 times the mass of the sun, but none had parent stars more massive than that. Perhaps this means that stars more massive than 6.5 times the mass of the sun explode? Maybe, maybe not. Perhaps the star cluster didn't have any stars more massive than 6 times the mass of the sun. This seems doubtful, but it's hard to be sure. Or perhaps the white dwarfs that came from stars 7 or 8 times the mass of the sun escaped from the star cluster, so we don't see them. All we know for certain from Messier 35 is that stars that are 6.5 times more massive than the sun make white dwarfs. We are also pretty sure that all stars less massive than this make white dwarfs, too. In order to determine which stars explode, we need to tackle this from the other end, too. Some colleagues of mine in Europe are looking at older Hubble Space Telescope pictures of nearby galaxies. If a supernova is seen in a galaxy, and if Hubble took a picture of that part of that galaxy, they can actually look and try to find the individual star that exploded. Along with some fancy statistics, they have determined that stars bigger than about 9 times the mass of the sun definitely explode. So, now we know that stars smaller than about 6.5 times the mass of the sun make white dwarfs, and that stars bigger than about 9 times the mass of the sun explode. The trick now is for both of us to continue to work, and try and squeeze those two limits together until they meet. Only then will we know for certain how big a star has to be to explode. A very personal and heartfelt thank you to all who have served the United States in the military. Whether you fought the battles of protecting us at home, fought abroad, secured the peace, or suffered at the cruelhands of our enemies, I deeply appreciate your service. Today it was announced that the Mars Phoenix polar lander sent her last transmission on November 2, over a week ago. At the North Pole of Mars, twilight is falling, and the lander can no longer recharge its batteries. So, after five good months of work, the mission is over. Unlike the Mars rovers, which are soldiering on after four-and-a-half years, we knew that Mars Phoenix couldn't last. And while there is a tiny chance that Phoenix could rise from the dead next Martian summer (one Earth-year away, as Mars's seasons last twice as long as Earth's), this is extraordinarily unlikely. Congratulations to the Phoenix team on a successful mission! Now the real work begins -- analyzing all of the data that Phoenix took over the past five months. That will keep scientists busy for years to come. On several science-related websites, I've been seeing a lot of chatter about President-Elect Obama and the tough science-related decisions awaiting him. For example, this article from space.com discusses the problems facing NASA, which is required to stop launching space shuttles in 2010, even though a replacement launch vehicle probably won't be available until at least 2015. NASA has lots of problems, and this is a biggie. Many people want Obama to put his money where his mouth was, and work for extra funding for NASA, and state that this is a priority. Frankly, while I think it is bad that America may soon be without a way to launch humans into space for 5+ years, I don't really want Obama spending a lot of time on NASA right now. We're embroiled in two wars, the economy is falling apart around us, and many people are losing their jobs by the hour. I'm sorry, but giving NASA an extra $2 billion to keep the shuttle flying isn't going to change any of that. That doesn't mean that NASA couldn't use the money, or that I think it shouldn't be done (it should!). What that does mean, in my opinion, is that Obama shouldn't be spending much time at all worrying about NASA right now, and that we shouldn't be badgering him to do so. I'd rather Obama spends his transition period worrying about the economy and foreign policy. Right now, arguments about competitiveness and technology don't carry much weight, and I think that the more we make a scene to try and get attention, the less attention we'll get. I think it is fine to write your Congresspeople and ask them to increase the NASA budget, perhaps as part of a stimulus plan -- after all, aerospace engineers are American workers, too! But I think it would be detrimental to harp on the issue. The overwhelming majority of Americans, myself included, are much more worried about retirement savings and banks then about NASA's woes. Let's let Obama get a good handle on those solutions before we try and divert his attention to other issues. The past few nights, I've watched as the waxing moon has slipped past two planets in our sky. While the moon has continued on its way, the two planets, Venus and Jupiter, are still there. If you've never seen a planet before (or are unsure if you have), now's your chance to see two of 'em without having to stay up late! Shortly after sunset, as the sky starts to get dark, look to the southwest (the sun sets in the west, so look to the left of where the sun set). You should see two very bright "stars". They're the brightest things in the sky at that time of night, so there's no mistaking them with other stars. If you don't see them, maybe the sky is too bright -- check again in another 15 minutes or so. The brighter of the two, which is closer to the point where the sun set, is Venus. Jupiter is a little higher and further away from the sunset. If you watch these two planets over the next month, even if you just glance up once every few days, you can actually see them moving closer together in the sky. If you've never noticed the planets moving before, this is a great chance! By the end of the month, the two planets will be really close together (as viewed from Earth; they'll be hundreds of millions of miles apart in reality). Even though I am a professional astronomer, I love to watch the planets dance together like this. It makes it easy for all of us to actually see the motions of things in outer space. And you don't need any special equipment -- just look up shortly after sunset. One question we astronomers get asked a lot is, "how does your research help society?" It's a fair question, but it is often hard to answer. The connections are often not direct; it's not like my understanding of the life of a white dwarf star is going to cure cancer. But there are indirect connections. Many years ago, I worked on an X-ray astronomy project. The mathematical tools that another astronomer had developed for the project were useful for mathematically similar problems, and that astronomer and some medical researchers found that the same tools were useful at diagnosing a specific kind of dangerous heart arrhythmia. Anyway, on our daily astronomy preprint server (where research articles are posted before they actually appear in our professional journals), a dark matter researcher named Leo Stodolsky posted an article on the "practical applications of dark matter research." Dark matter is a mysterious substance that interacts with normal matter (the stuff out of which we are made) primarily by gravity. There are many ideas as to what dark matter could be, some of the favorite models are weakly interacting particles, which means subatomic particles that can interact by gravity and by the weak nuclear force, a force of nature that works only on subatomic scales and is, well, weak. If dark matter can interact with itself and with normal matter by the weak force, then very sensitive detectors cooled to temperatures near absolute zero (about -460 degrees Fahrenheit) might be able to detect dark matter. The atoms in these really cold detectors have virtually no energy. So, if a dark matter particle passing through the detector interacts with one of these atoms, the dark matter will give the atom some energy. The heat from that tiny amount of energy can be measured (or this is the idea). Several physics groups, including the group in which Dr. Stodolsky works, have built these detectors and are trying to "see" dark matter. As of yet, no one has definitively seen dark matter. This is because these very sensitive detectors have lots of sources of energy besides dark matter interactions (like radioactive decay from radioactive elements in the detector itself). So, most of the time these teams are tracking down and eliminating this noise, which allows the scientists to get closer and closer to the point at which they think they'll be able to see dark matter. In his paper, Dr. Stodolsky points out that, as he has been working on his detector, he's discovered some uses for his work besides just dark matter. For instance, an early version of the detector kept getting microscopic cracks in it because the detector was pinched too tight in one spot. When the cracks appeared, they released energy that looked a lot like the seismic energy released during earthquakes. So, it may be possible to understand some aspects of earthquakes in the laboratory, where microscopic "earthquakes" could be produced on demand. A second story related by Dr. Stodolsky involves a different detector. Again, it was very sensitive at measuring energy. In biology, scientists often want to study the chemical makeup of individual proteins. These detectors are sensitive enough to be able to measure the energy of different protein molecules and tell them apart with much higher precision than earlier biological instruments. Using a contraption containing one of these detectors, the physicists and biologists were able to build a commercial detector that can help diagnose certain types of liver diseases. Both of these inventions came out of studies of dark matter, and were completely unexpected and unanticipated byproducts of research! I could give other examples (but I won't) of astronomy research that ends up having practical applications. We don't usually expect these applications at the beginning of a project, and they are rare. But it does allow us to claim that astronomy is good for more than just understanding the Universe in an abstract sense -- it can, and sometimes does, lead to useful applications back home on Earth. Monday, I watched the first part of the Monday Night Football game between the Pittsburgh Steelers and the Washington Redskins. Near the start of the broadcast, an interesting fact was mentioned: In 16 out of 17 instances, if the Redskins won their final game before a presidential election, then the incumbent party won the presidency. If the Redskins lost, the other party won. The one exception was 2004, when the Redskins lost but Bush won re-election. So, you can actually rephrase the fact to say that, in 17 out of 17 instances, when the Redskins won their final game before a presidential election, the party that won the popular vote in the previous election won the presidency in the new election, and if the Redskins lost, the party that lost the popular vote in the previous election won the presidency (this is because Bush lost the popular vote in 2000). And, since the Redskins lost on Monday and the Democrats won the election, the Redskins are now 18 for 18. At first glance, this sounds like it can't be a coincidence. A quick calculation makes it look like the odds of this happening are 1-in-260,000. So, how can the presidential election possibly be influenced by the results of a football game? The answer is: it's not. There's no relation. The Redskins football game does not influence the election. And while 1-in-260,000 sounds like long odds, with millions of people looking for silly ways of predicting the presidential election, some random occurrence with small odds is almost certain to appear! This doesn't mean that the two events are related. There is a fancy Latin phrase for the belief that, because two things happen in sequence, there must be a link between them: post hoc ergo propter hoc. An example of this is the famous story of the rooster who noticed that the sun rose every day after he crowed, and so he assumed that his crowing caused the sun to rise. One day, the rooster overslept, yet the sun rose anyway. There are indeed related events. If I aim a gun across the room and pull the trigger, and an instant later someone across the room falls to the ground with a gunshot wound, there's a pretty good reason to suspect that the two events are related. But there's a difference between the rooster crowing/sun story and the gun story: in the case of the gun, there's a physical and testable link between the two events. In the case of the rooster crowing, there's just no logical explanation for how a rooster crow could cause the sun to rise. In astronomy, we are always in a battle to understand cause-and-effect, and to determine if observed trends and correlations are real, or just chance. For example, a supernova (exploding star) happens in a typical galaxy every 50 or 100 years. In 2007, a NASA satellite detected two supernova explosions from the same galaxy, only two weeks apart! If we knew nothing else about supernovae, we might think that, somehow, the explosions were linked. But they aren't -- they're thousands of light-years apart. If you calculate the odds, the chance of seeing a second supernova in a galaxy within two weeks of a first one is about 1-in-1000 or 1-in-2000. That sounds low. But, we are now looking for supernovae in thousands of galaxies, so the odds of seeing two closely-spaced supernovae are actually pretty high. My point is (and I do have one), just because two things happen close together, and the odds seem like it cannot be chance, it still can be chance. If you want to think that one thing causes another, try and think of a reasonable explanation on how to connect the two. If there is no reasonable explanation, it's probably chance. Sorry, Redskins fans, but your team doesn't determine the outcome of the election. Mrs. Astronomy expressed regret that our costumes were not as original as, and, in some cases, were identical to, last year's collection. My (utterly made up) response is: tough economic times call for paring back. And, may I point out, her costume was the same as for the past several years: a pair of Groucho Marx glasses. How much does that pretty Hubble picture cost you? Over the past couple of weeks, I've had a poll over to the right asking how much you, as a taxpaying individual, would be willing to shell out on a yearly basis to support astronomy research. The median answer was $100. If I want to be fancy and take a logarithmic average (since I gave you options on a logarithmic scale, and counting the two "none" answers as "$1," because zeros and logarithms don't get along), I get $52.75. So, what do you actually pay? That's hard to determine exactly, so the numbers I'm going to throw out probably overestimate the true amount by quite a bit, maybe even a factor of 2 or more. The numbers I quote come from this study by the American Association for the Advancement of Science, one of the largest and most prestigious scientific organizations in the US. In 2007, the IRS processed 139 million individual tax returns. Now, the US government gets taxes from many other sources, like various corporate taxes, but let's assume that it all comes from individual returns. And let's assume that each of those 139 million people pays the same share. Bad assumptions, I know, but this is just an order of magnitude calculation anyway. Most ground-based astronomy is supported by the National Science Foundation. Their fiscal year 2008 budget for astronomy was $233 million. So, that cost you $1.67 this year. The largest chunk of astronomy money, though, comes from NASA's Science Mission Directorate, or SMD. NASA's SMD oversees (almost) all U.S. government funded space science, including the Hubble Space Telescope and other space telescopes, missions to other planets, and even satellites that study Earth's environment. It does not include manned spaceflight. For FY 2008, the NASA SMD budget was $5.2 billion. Now, we could potentially remove the Earth Science portion of that budget (about $1.5 billion), but the repair mission to Hubble (paid mainly out of NASA's Human Exploration budget), roughly balances that out. So, let's leave the number as is. So, the typical taxpayer share of NASA's astronomy research budget is $37.41. Astronomy also gets money from elsewhere. Since the discovery of "dark energy", we've gotten some money from the Department of Energy's High Energy Physics research budget. For 2008, that budget was $689 million. About 2/3 of that goes to particle accelerator work, which we don't count as astronomy. But let's say that astronomers get all of the rest (which isn't true), or $230 million. In that case, your 2008 tax bill for the DOE astronomy research was $1.65. Finally, the Smithsonian Institution gets $183 million a year for general research. Astronomy is just one portion of the Smithsonian's research budget, paying for a research institute in Boston and for portions of several telescopes. Let's assume that we astronomers get the whole budget, though we only get a fraction. In that case, your tax bill for Smithsonian astronomy comes to a whopping $1.32. So, adding this all together, astronomy in the U.S. received about $5.85 billion in taxpayer money in 2008. If this is spread equally among all taxpayers, this comes to $42.05 per taxpayer per year, with most of that coming from NASA's space budget. And this is close to the logarithmic average of my very small and non-scientific poll. So, it looks like we astronomers have roughly the amount you are willing to pay us. Just as a reminder, the 2008 budget deficit was $438 billion. So, if we eliminate all astronomy from the federal budget, the deficit would only be $432 billion. Not really a huge savings. In other words, Hubble is not bankrupting our government, which is good to know.